for where I'm at. Right now. In this teeny tiny house, in this cold, cold, northern Wisconsin town, for the few, but true friends that I have found. For the sweet little pals that Zoey has. For the peace that I have found within the union of husband and wife. For the opportunities that have been placed before me. For the ability to see what it is that I can do. For the belief I've learned to place in myself as well as in something greater. Thankful for being able to see that there is great power in believing. For the understanding and support of loved ones. For having just enough of everything. Really have been thankful for having "just enough" lately. In this time of so many living with plenty. There is something sweet about seeing what is before you and knowing that it will work just fine. Thankful for the ability and willingness to have faith. Faith that we have the tools needed to do what needs doing, when we will need to do it. Thankful for facing hardships and in coming away from them stronger and better and wiser. Having the knowledge that we can help others, sometimes just by simply being and nothing more. And at times, thankful for the wisdom of having open eyes and mouths that stay closed. For the intensity and the devastation that is life, I am thankful that I am here willing and able to experience it. A favorite, that I am sure that I have shared before, but feel compelled to share again. Exciting Things to Share and a Contest! Really excited about being asked to join the permanant team of designers for Kits & Pieces as well as accepting the position of message board moderator for their new site. 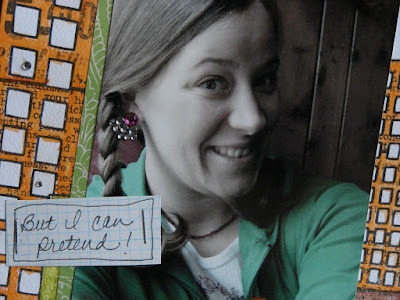 There will be lots of challenges and contests coming up in the near future and it's just fun having a place to chat about everything relating to scrapbooking! Please stop on over and register so that you can hang out with all of us, there are still lots of changes going on as we figure out what we want for the site and a new gallery is on it's way so that we can share all of our beautiful creations with one another. To celebrate, right now we are having a contest we're calling the Sweet & Simple Contest. All you have to do is create a layout (newly created for this contest, any size, two-page or one) and the only requirement is that the journaling has to be in the format of a list. It's that simple! 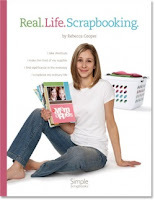 Post it on the Kits & Pieces message board in the contest category along with the others and on February 14th a member of the Kits & Pieces design team will choose a random winner and they will receive a copy of the book titled Real.Life.Scrapbooking., by Rebecca Cooper. I hope that you decide to participate, and if you do we look forward to seeing what you create! Some More Layouts for IAAS! 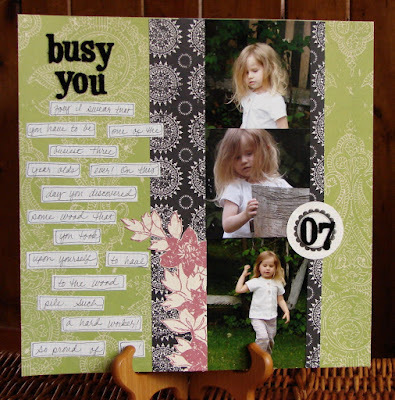 Some more goodness from my January Kit from I Am A Scrapaholic! 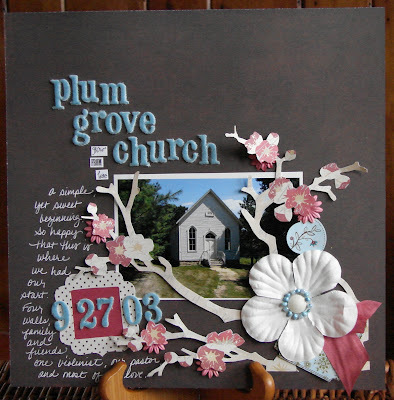 I'm having so much fun being there guest designer this month! I loooooove the Prima paintables so much, I feel like a true artist using my watercolor pencils and Sakura Koi Water Brush (which is simply a genius idea!). Sometimes looking at my Zoey girl, I swear she is straight out of a fairytale! This is one of my favorite photos of her, looking in her eyes I feel as though I can see her soul! Close-Up of glitter on the flower. 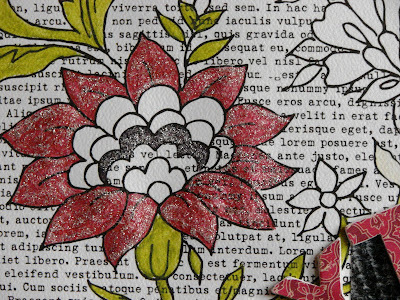 I used ink for the flower w/ my pen nibs from Ranger and water color pencils for the greens and yellows. 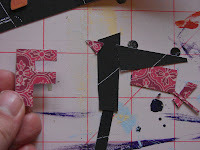 Adhered Collage Press pp's to some chipboard letters, cut out w/my craft knife and sanded. Added some glitter to the flower too! 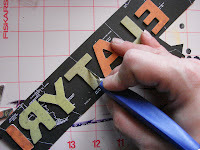 I didn't have enough letters from the kit (I used them all up on my previous layouts!) 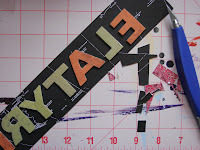 so I found some miscellaneous ones from my stash and adhered them to patterned paper and then cut out with my craft knife and I had perfect letters that went with the theme of my layout. After cutting the letters out I sanded them for a more finished look. This was a fun one to do! Journaled about how I am not a city girl, took apart one of the Prima blings and put individual rhinestones in some of the buildings' windows and the rest is my earring in the photo! 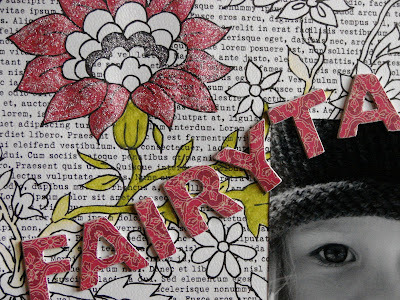 More of a fun page for my art journal I think, a fun one nonetheless! This month I'm the Guest Designer at I Am A Scrapaholic and have been having so much fun designing with their January kit which includes some of the latest goodies from Collage Press, Making Memories and Prima! Just thought I'd share what I've done for them so far (mostly have had fun with the CP pp's!) but will be working with some of the Prima paintable pp's soon so be sure to check back! Journaling Reads: You love painting your nails and call them your "little pretties" red and bright pink are your favorites (colors). I wish you a lifetime of little pretties Zoey! 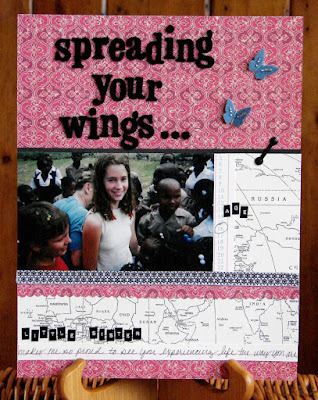 Journaling Reads: Little Sister - Makes me so proud to see you experiencing life the way you are. Journaling reads: sitting here in the very chair that I sat in for meals growing up with my mother and father makes me so very happy. The paint is now peeling but it still works just fine and was such a special touch and will serve as a sweet memory to hold on to for always. Thanks for being so thoughtful when setting the table mom. Picture taken at Grandma Sue and Grandpa Ross's, Thanksgiving 2007. Journaling Reads: Zoey I swear that you have to be one of the busiest three year olds ever! On this day you discovered some wood that you took upon yourself to haul to the wood pile. Such a hard worker! So proud of you! Can't believe that it's taken me this long to actually make one of these! I made a pasty for the very first time last week (mom, you would be proud!). It's such a challenge to come up with interesting and new things to make for my vegetarian husband, (and sometimes downright frustrating!) 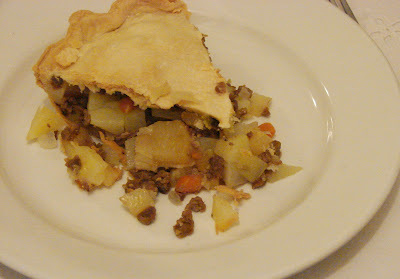 and the other day I was craving pasty, something that I grew up having and which was a pretty common dish served in the town that I lived in early on growing up with my family. 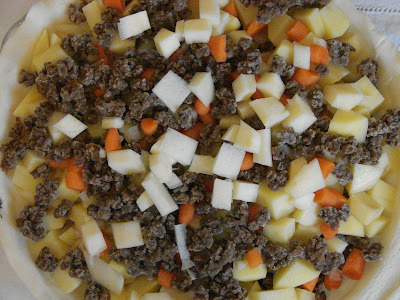 For this version, I just substituted the ground beef to veggie crumbles and you could barely make out the difference! And Ethan was pleased as punch, as was I! 3-4 tablespoons of either cream of celery soup or butter (to sprinkle on top of the ingredients before placing the top crust on to bake. 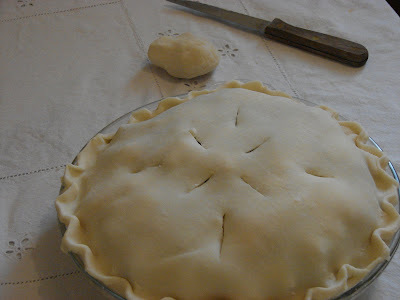 Make pie crust: Mix flour by hand with 1/2 of shortening till crumbly. Add remaining shortening and continue to mix. Salt may be added to flour if desired. Add water- mix with fork until forms into a ball. Roll out into top and bottom crust. Put uncooked pie crust into bottom of 9" pie plate. 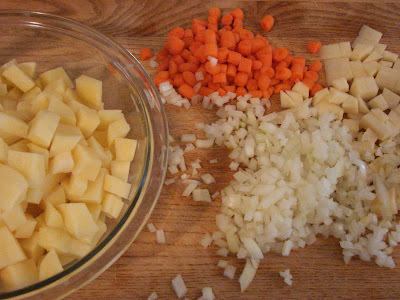 Cover with a layer of sliced (or diced) potatoes. Sprinkle with 1/3 of the onions. Crumble 1/2 ground chuck (or veggie crumbles!) and spread over potatoes. Continue layering ending with potatoes and onions. Put 3-4 tablespoons of soup or butter on top of mixture and cover with top crust. Put a few holes in it for steam to escape. Bake approximately 1 1/2 hours until potatoes are soft. Let sit 10 minutes before slicing. Serve in slices as a pie with Chili Sauce (or ketchup) on the side and enjoy! I was so excited to see that I got to work with the Wonderland Kit this month from Kits & Pieces! 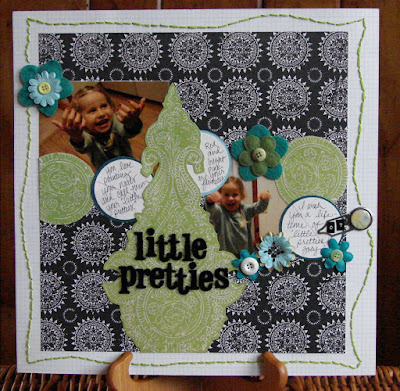 The Heidi Grace patterned papers, complimented the Prima Heavenly flowers and snowflakes perfectly, as well as the KI paper lace, American Crafts chipboard elements, Doodlebug Design Inc. letter stickers and cotton lace trim. I also had some fun using my glaze pen (included in one of the many offered expansions). Another nice thing about this month's kit was that it included a glue ring! 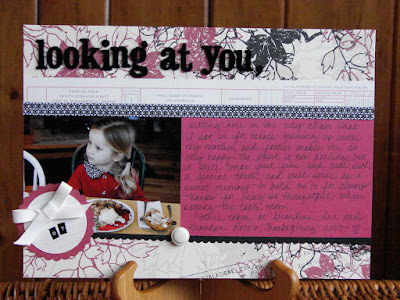 Something essential to every scrapbooker! 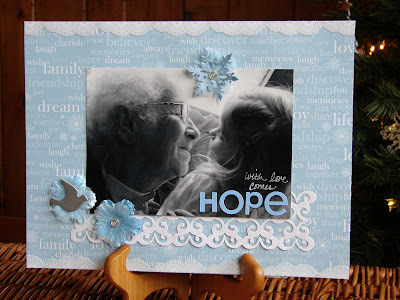 With Love Comes Hope, Supplies from the kit include: Heidi Grace pp, KI paper lace, Heavenly Prima florals and snowflake, American Crafts chipboard elements. 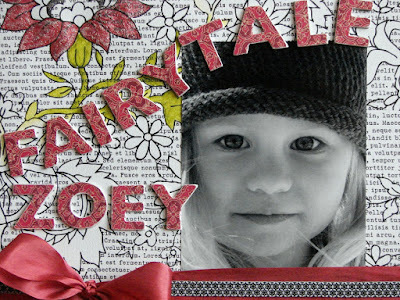 Doodlebug Designs Inc. letter stickers and Glaze pen. Misc. item from my personal stash: buttons. 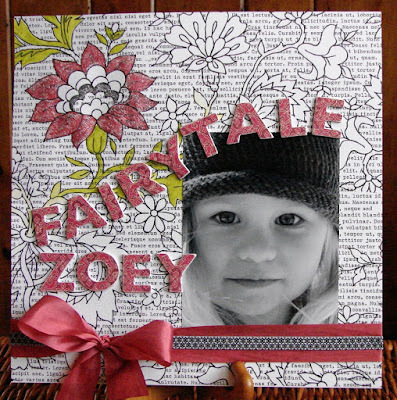 Winter Play, Supplies included in the kit include: Heidi Grace pp, Bazzill cardstock, Heavenly Prima snowflakes, AC chipboard and Doodlebug Designs, Inc. letter stickers. And just to show that you do not have to do a seasonal layout using this kit I chose to do one of my in-laws while vacationing this past Spring. The KI paper lace really compliments the photo I think! 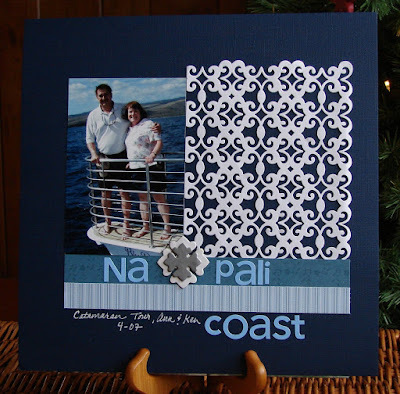 Na Pali Coast, Supplies included in the kit: Bazzill cardstock, KI paper lace, Heidi Grace pp, AC chipboard elements, Doodlebug Designs, Inc. letter stickers and Glaze pen. 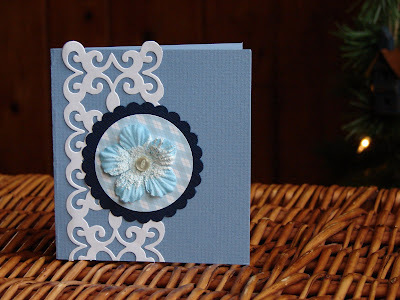 Flower and Lace Card, Supplies included in the kit: Bazzill cardstock, KI paper lace, Heidi Grace pp, Heavenly Prima flower. Misc item from my personal stash: button. 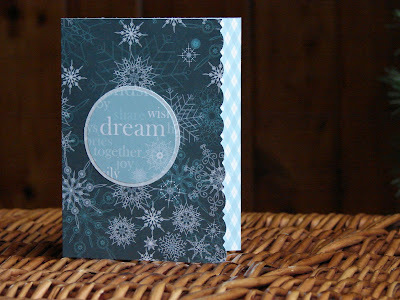 Snowflake Card, Supplies included in the kit: Heidi Grace pp. 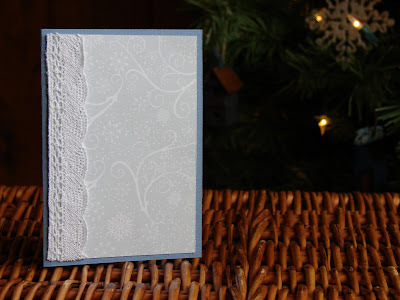 Simple Lace Card, Supplies included in the kit: Bazzill cardstock, Heidi Grace pp, cotton lace trim. Also, be sure to check out the sale on all past kits this month. Linda is selling past kits at some pretty reasonable prices as well as selling individual items from past kits that were overstocked. 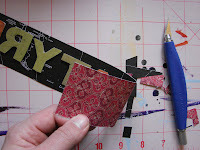 I picked up a scalloped 7gypsies self inking stamp, some American Crafts platform chipboard letter stickers, some rub-ons by Fontwerks and more! Hurry, as everything is going fast! in there life, right? About a month or so before Christmas we went to the toy store to kind of feel out what Zoey's interests were and to get some hints from her for gifts, etc. It's also just something that we do from time to time cuz she loves getting to play with the Thomas and Friends play table that they have set up there. 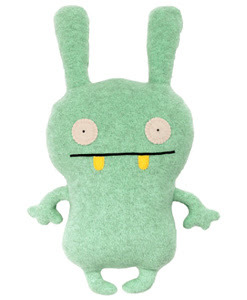 Anyways, on this particular visit she discovered Ugly Dolls. I wandered away from her at one point during our toy store visit and when I came back to the train table she was parked on the floor a couple feet away with about a dozen of these strange little creatures surrounding her and of course the scene wouldn't have been complete without her making the little voices for each and every one of them (which she was doing very nicely). This one (the one that Santa brought to our home this year) is named Moxy and this is her story: Moxy’s got a lot of moxy. She’s a real get up and go Ugly, with far more energy than her older brother OX. Why the big antennas? Moxy uses them to pick up signals from all over. Just the other day, OX gave the signal for them to remove any chocolate based substances from the fridge. Moxy is very curious about YOU. What’s up with you? Why don’t your toes point towards each other? Please discuss. Yep, toys with an attitude. Gotta love it! Though I think that the one thing that I can appreciate most is that Zoey is most concerned that Moxy's teeth are yellow due to not brushing appropriately. So, at least she is motivated to keep up with her brushing now!